About: Dieci is an Italian restaurant at No. Ten Manchester Street, a stylish boutique hotel on a quiet street in Marylebone, a stone’s throw from Baker Street or Marylebone stations. Headed by Executive Chef Cristian Gaimarri, Dieci serves up classic Italian dishes featuring seasonal local ingredients and meats and cheeses from small Italian producers. The restaurant itself is an intimate affair: the dining area seats around 24, and the plush sofas and jazz make it a lovely place for a romantic night out. Yet this is also a popular spot for corporate meetings particularly at the cigar lounge, or more often in the cosy sampling room where you can linger over a cigar and whisky until 1 in the morning. Dieci's humidor deserves a special mention – you'll be spoilt for choice with their range of fine, fragrant Havana cigars (from £14 per cigar) which even includes a few UK market exclusives. Their staff, who clearly know their stuff, will be happy to assist you in choosing a suitable cigar from the extensive cigar menu. What We Ate: I love it when restaurants pay attention to their bread baskets, and Dieci's surpassed my expectations. We had a decent selection of breads, including a shockingly tasty house-made foccacia with rosemary and crunchy sea salt, and slices of tomato bread which left a savoury, spicy burn at the back of the throat. We were particularly enamoured of the pane carasau, a crispy Sardinian flatbread sprinkled with rosemary and baked with olive oil. It was quite difficult to resist over-indulging with bread of this calibre. For starters we had the Piemont fassone beef tartare served with mushroom sauté & Umbrian black truffle (£12.50) and Andrian burrata, smoked aubergine, and Bloody Mary salsa (£9.50). The beef tartare is one of their best-selling starters, and I wanted to love this but didn't quite. While the beef was well-seasoned, and showered with thick shavings of fresh and lovely Umbrian truffles, the hot sautéed mushrooms left the tartare on the warm side. I also felt that it could have been chopped less finely for improved texture, and a little more sharpness or acidity would have also helped. The burrata, though, was divine – an unabashedly, gloriously creamy hunk of fresh cheese paired with an intensely smoky aubergine puree. You pour over a Bloody Mary salsa-sauce, which cuts through the creaminess of the burrata with a lovely hit of spiciness and acidity. A well-thought out and beautifully executed starter I'd happily eat again. One cannot eat at an Italian restaurant and forego pasta, so we gamely ordered two – the Canadian lobster pasta (£26) and Tuscan Pici pasta with lamb ragout (£14.50). The lobster pasta was an impressive looking dish – with spaghetti drenched in a deep tomato and lobster sauce, lightly spiced with Calabrese chilli. No matter how impressive that lobster was, it paled in comparison to the Pici pasta. The simplest dish of the night was also our unanimous favourite – a completely unassuming mound of pasta topped with a perfunctory sprig of rosemary. This was the ultimate in Italian home cooking. Each mouthful of soul-warming pasta was lightly bathed in a slow-cooked lamb ragout and Castelmagno cheese, and we were sorry when we'd finished scraping the plate clean. Our second main courses, the oven-baked veal shank with parmigiana risotto (£30) and red-wine braised baby lamb shank (£25), were equally impressive - well-executed versions of the Italian classics, they are sure to please any red-blooded carnivore at the dinner table. Noteworthy, however, was the meltingly rich bone marrow in the veal – so bad for your heart, but so good for your soul. Also particularly intriguing was the pasta accompanying the lamb shank. Sardinian fregola – and not strawberries (fragole) as we originally thought – is a kind of hand-rolled pasta. In its uncooked form it looks similar to Israeli couscous, but cooks up into little sago-like cubes but much firmer and chewy in texture – very disconcerting if you're expecting a more traditional pasta, but we quickly grew to enjoy it as it soaked up the lamb shank sauce very nicely. By this time we had room left for just one dessert, shared between us – the Sicilian Bronte pistachio semifreddo (£8.50). It was deliciously nutty and lighter than an ice cream, but a pool of melted dark chocolate gave it a dash of va-va-voom. A lovely end to what had been a rich and hearty meal. 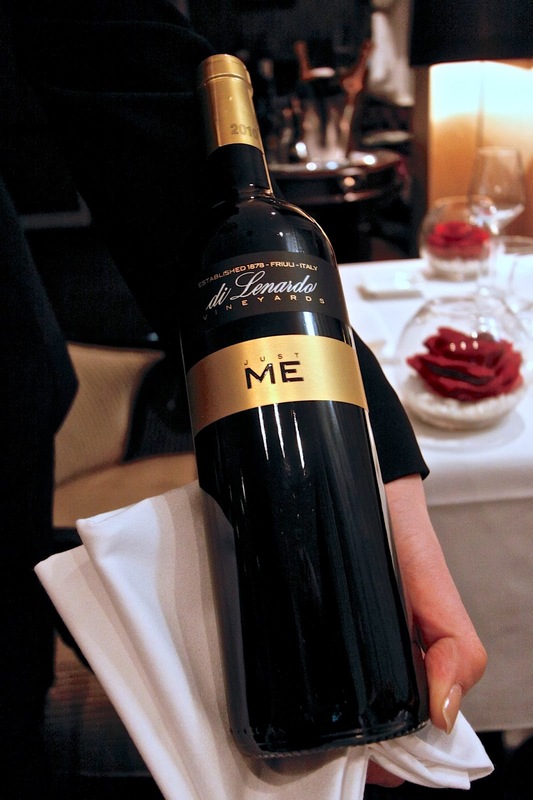 What We Drank: Dieci sources many of their wines from small Italian producers, and we drank a superb Merlot recommended by restaurant manager Paola Gaimarri – the Just Me 2010 (£52/bottle) from di Lenardo Vineyards in the Friuli region of North Italy. It was luscious and velvety, juicy with lots of cherry notes and dangerously drinkable – possibly one of the best Italian wines we'd had in a long time. With dessert we had the Glenmorangie Signet – a very fine whisky that went down a treat with the dark chocolate. Likes: The restaurant’s attention to seasonal produce, which is reflected in the construction of the menu, the unusual and regional breads, pasta and cheeses, some of which were unknown to us was intriguing and educational. It was a rather cold night when we went, and comfort dishes like the Pici pasta and ossobuco were all we needed. Portions are also quite generous, and the bread basket was exceptional. Dislikes: While the beef tartare tasted lovely we felt it a bit of a shame to have those beautiful truffles with a warm, raw beef which also lacked in texture. While the lobster was quite delicious, I found it a tad overcooked. Verdict: Dieci is a fine addition to a group of excellent restaurants in the surrounding area (which include Pied Nus and the Royal China Club). A perfect meal here consists of burrata, the Pici pasta with lamb ragout and the pistachio semifreddo, all wash down with a bottle of "Just Me" Merlot. Highly recommended. Can't beat Italian so I'll be checking it out.